Shenehon has released a Special Edition newsletter featuring an in-depth analysis of the Twin Cities apartment market by Real Estate Valuation Analyst Bradley Dulas. The report provides an overview of trends and activity in the market during 2014 and projections for 2015/2016. Access the special edition newsletter. Joshua Johnson, Senior Valuation Analyst at Shenehon Company, was the featured expert in an in-depth interview on business valuation issues by Morgan & Westfield. To see the entire interview, visit the Morgan & Westfield website. Supported by an improving economic outlook and employment growth, the commercial real estate market continued to note progress through the close of 2014. Although remaining relatively moderate, employment growth was experienced within most major markets and across most sectors during the year, as the unemployment rate continued to decline. Coastal markets and technology hubs recorded the most robust employment growth in 2014, while job growth within the Midwest region was led by the Chicago and Twin Cities markets. Non-farm employment in the Twin Cities metropolitan area increased 1.8% on the net addition of 32,100 jobs in 2014, and the area’s unemployment rate decreased by 100 basis points, falling from 4.3% in December 2013 to 3.3% in December 2014. Employment growth in the Twin Cities market was led by the manufacturing and professional/business service sectors during the year, though year-on-year payrolls increased across nearly all sectors. Led by demand for logistics space, market conditions in the industrial sector at both the national and regional levels continued to improve in 2014, with strong absorption figures driving vacancy rates lower and putting upward pressure on asking rents. Closely mirroring trends at the national and regional levels, demand for industrial space in the Twin Cities market remained strong during the year, as vacancy rates declined and asking rents increased in the face of rising new construction activity. Although the outlook for the industrial market remains upbeat, lower oil prices and a stronger dollar could adversely affect demand and occupancy levels in markets dependent upon the energy sector and port activity. Favorable demographics and employment growth continue to drive strong apartment absorption figures, while macro-level trends, including hefty student debt levels, contributed to apartment demand throughout most of the nation, including the Twin Cities market. New apartment deliveries in the Twin Cities market began to weigh on occupancy levels within the Class ‘A’ segment during 2014, but overall the local apartment market remains healthy. In spite of the progress made during the year, the rise of e-commerce and the pursuit of smaller footprints by retailers held back stronger growth in the retail sector at the national, regional, and local levels. While macro-level trends impacted demand, positive absorption figures fostered modest improvements in operating fundamentals. Similar to trends through most markets, the Class ‘A’ segment in the Twin Cities retail market has noted significant progress. While headwinds will continue to persist for the retail market, moderate demand and higher sales-per-foot trends will continue to facilitate improving market conditions. 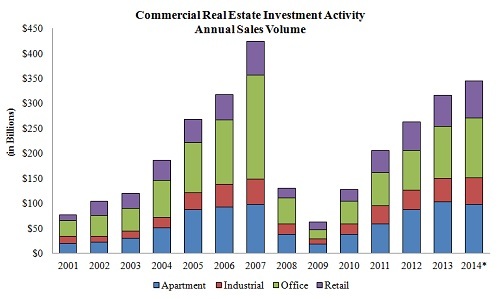 Paralleling the retail market, momentum continued to build in the office sector during the year. Although elevated, office vacancy rates trended downwards and asking rents advanced at the national, regional, and local levels in 2014. Smaller per employee space requirements by office users remain to be the largest obstacle facing the office sector, as the trend toward telecommuting appears to have lost some traction and businesses are gradually expanding headcounts. The Class ‘A’ and Central Business District segments are leading the Office sector recovery, but conditions are becoming ripe for the Class ‘B’ and Suburban segments to catch up in the months ahead. Fueled by the availability of financing and attractive yields relative to alternative investments, investors are optimistic about the outlook for commercial real estate. More capital is available in the market, boosting investor confidence, and the yields commercial real estate property is delivering remains favorable compared to alternative investments. Increasing by over 5.0% year-on-year in 2014, annual sales volume at the national level among the four major property types has risen for five consecutive years. Accounting for nearly 35.0% of all sales activity among the four major property types, rising sales volume was driven by the office sector during the year, while the biggest year-on-year increase in sales volume was noted within the retail sector. Strong fundamentals, favorable demographics, and a diverse employment and economic base continue to attract investors into the Twin Cities market. Property and portfolio sales of more than $2 million totaled approximately $3.8 billion in the local market during 2014, up roughly 20.0% from 2013. Mirroring national trends, sales volume in the Twin Cities was led by the office sector, which accounted for nearly 40.0% of all sales activity during the year. The apartment sector, however, posted the largest year-on-year increase in the local market. Led by demand for distribution space, the pace of absorption within the national industrial sector remained robust through all four quarters of 2014, marking the 19th consecutive quarter of positive net absorption. Absorbing over 150 million square feet during the year, absorption figures increased by nearly 10.0% compared to 2013. Demand was strongest within the Inland Empire, Chicago, Atlanta, Los Angeles, and Indianapolis markets. Although recording positive absorption within the light industrial and light manufacturing sectors, absorption continues to be driven demand for logistics space, as the continued emergence of e-commerce facilitates strong demand for warehouse and distribution space. Logistics users are focusing heavily on available space with 50×50 column spacing and clearance heights of at least 24 feet, with many distribution users seeking clearance heights of over 32 feet. Due to the region’s strategic location, lower cost of business, and other market-specific drivers, several markets within the Midwest region posted impressive absorption figures in 2014, including the Cincinnati and Cleveland markets. Surpassing historical norms, demand in the Twin Cities industrial market essentially kept pace with robust absorption noted in 2012 and 2013, with the strongest absorption figures noted in the Northwest submarket. Industrial developers continued to respond to strong demand by increasing the pace of new construction activity in 2014. New construction deliveries added over 110 million square feet to the national industrial inventory during the year, representing a year-on-year increase of approximately 60.0%. Construction activity was relatively healthy across most major markets, but the Inland Empire and Dallas-Fort Worth markets witnessed the greatest increases in inventory during the year. An additional 100 million square feet remain under construction, with the Atlanta, Dallas-Fort Worth, Chicago, and Houston markets possessing the widest industrial constrution pipelines. Approximately 15 million square feet remains under construction within the Atlanta market alone, including a number of large development projects in the South Atlanta submarket. Construction broke ground in the third quarter of 2014 on a 1.2 million-square-foot, build-to-suit, e-commerce center for Wal-Mart in Union City, and work is underway on 1.2 million-square-foot distribution center for Kroger on the grounds of the former Fort Gillem Army base. Developers continued to add new inventory within the Twin Cities industrial market in 2014, and broke ground on roughly 3.5 million square feet during the year. Despite an accelerating pace of new construction activity, the vacancy rate in the national industrial market decreased by 50 basis points in 2014, falling below 8.0% at the close of the year. Occupancy levels have increased within most major markets, and vacancy rates remain incredibly tight among a number of markets in the West region, including the Orange County and Salt Lake City markets. Vacancy rates within the Midwest region remain tightest in the Indianapolis, Omaha, and Cincinnati markets. In spite of an active construction pipeline, the overall vacancy rate declined by 60 basis points within the Twin Cities industrial market in 2014. Fostering solid rent growth in 2014, roughly half of all major metropolitan markets noted rising asking rents during the year. Led by strong occupancy levels for logistics space, year-on-year asking rents were up over 2.5% in 2014, outpacing the 2.0% gain noted in the year prior. The pace of rent growth during the year was aggressive within the Nashville, South Florida, and Denver markets, and asking rent growth also remained strong among markets in the Northeast region, due to the increasingly limited availability of land suitable for industrial development in the region. Asking rents also improved across most major markets within the Midwest region, including the Twin Cities market. On the heels of a banner year in 2013, sales volume in the national industrial sector increased by approximately 13.0% in 2014 compared to the year prior, as sales volume in the industrial market exceeded $53 billion during the year. Sales activity remained strong for warehouse and distribution properties in 2014, but the light industrial sector noted the largest year-on-year gain in investment activity during the year. Comprising a significant portion of the nation’s annual total industrial sales volume, a number of major portfolio transactions closed in 2014, including a four-property portfolio containing nearly 1.65 million square feet of industrial space along major transportation corridors in northeastern Pennsylvania. KBS Realty Advisors sold the four-property portfolio to Chambers Street Group, a publicly traded REIT, in November of 2014 for $105.7 million or approximately $64.50 per square foot. Located along the Interstate 81 corridor, with close proximity to Interstates 78, 80, and 84, the properties are within a day’s drive of several major metropolitan markets and near three East Coast ports. All four of the properties have excess auto or trailer parking and two of the four buildings are expandable by up to nearly 400,000 square feet. The portfolio was purchased at a going-in cap rate of 7.6% on in-place income. One of the largest single property industrial transactions involved the sale of 14600 Innovation Drive, a 600,000-square-foot distribution facility located within the Inland Empire market. Situated within the Meridian Business Park, a 1,290-acre master-planned commerce center in the city of Riverside, the property sold for $43.8 million or $73 per square foot in October of 2014. In the face of an increasing pace of new construction activity, strong demand in the national apartment market continues to support tighter market fundamentals. Favorable demographics, employment growth, and macro-level trends serve as tailwinds and continue to drive apartment demand. Recording positive absorption across most major markets, demand for apartment units is strongest within the West and South regions. The Chicago, Columbus, and Indianapolis markets led apartment absorption in the Midwest region in 2014. Demand for apartment units remained healthy within the Twin Cities market for the fifth consecutive year in 2014, with absorption totaling nearly 12,000 units during this period. New construction added nearly 250,000 units to the national apartment inventory in 2014, up approximately 40.0% from the previous 12 months. Developers added nearly 20,000 units in the Washington D.C. market alone during the year, while new deliveries within the Dallas-Fort Worth, Houston, and Austin markets totaled roughly 45,000 units in 2014, as building activity remained brisk in the Texas markets. New apartment construction activity also picked up among a number of high-barrier-to-entry California markets and the pipeline in the Seattle market continued to expand. Activity in the Seattle market is concentrated in downtown Seattle, with construction underway on a number of ambitious development projects including a 355-unit, 41-story luxury apartment tower within the South Lake Union neighborhood. Multifamily starts and construction permitting figures at the national level surpassed the historical average in 2013 and permitting activity increased throughout 2014, indicating new apartment construction activity will remain strong through the near-term. New apartment construction volume in the Midwest region was led by the Twin Cities and Chicago markets. Facilitated by strong demand, the vacancy rate in the national apartment market declined by 10 basis points during the course of 2014, falling from 4.3% in 2013 to 4.2% at the close of 2014. Since 2009, the vacancy rate at the national level has shed nearly 400 basis points. Due to healthy demand and limited new deliveries aimed at the lower tier segments, declining vacancy rates in the national apartment market during the year were heavily supported by strong occupancy levels at Class ‘B’ and Class ‘C’ properties. Meanwhile, the amount of new construction aimed at the luxury rental market weighed on vacancy rates within the Class ‘A’ segment. Apartment vacancy rates remain sub-3.0% in the New York City market and throughout the Bay Area markets of San Jose, San Francisco, and Oakland. Average vacancy rates remain below the market equilibrium of 5.0% in roughly 70.0% of the nation’s largest 50 markets. Apartment occupancy levels within the Midwest region are strongest in the Twin Cities, Chicago, and Cleveland markets. The average apartment vacancy rate within the Twin Cities market hovers in the low-3.0% range, with upward pressure within the Class ‘A’ segment beginning to weigh on overall vacancies. Outpacing the 3.2% gain noted in the year prior, the average asking rent in the national apartment market increased by 3.7% over the year ended in December of 2014. Although the overall asking rent increased during the year, effective rents within a number of primary markets demonstrated signs of weakness in 2014, yet positive effective rent growth was recorded in most secondary and tertiary markets. Asking rent growth remains healthy across all property classes, but effective rent growth is strongest within the lower-tier segments. The most robust rent growth in the Midwest region was noted in the Cincinnati market, though positive gains were posted within all major markets in the region. Besting asking rent growth at the national level, year-on-year asking rent growth was recorded for the fifth consecutive year in the Twin Cities market in 2014. While representing a modest year-on-year decline, sales activity within the national apartment sector remained healthy through 2014. Totaling roughly $100 billion, sales volume in the apartment sector accounted for nearly 30.0% of all sales activity among the four major property types. Since 2012, sales volume in the national apartment market has totaled just shy of $300 billion. Cap rates have compressed among all regions, but remain lowest within the Northeast and West regions, particularly among high-barrier-to-entry markets. Major sales transactions recorded during 2014 included Brookfield Property Partners purchase of a six-property portfolio within the New York City market for $1.04 billion in October of 2014. Containing nearly 4,000 units within upper Manhattan and Roosevelt Island, the portfolio previously sold for approximately $940 million in 2007. One of the largest single-property apartment sales transactions during the year involved the 492-unit, K2 Apartments in downtown Chicago, which sold in November of 2014 for $214.25 million or approximately $435,500 per unit. Benefitting from increasing household wealth and consumer spending, healthy demand in the national retail market facilitated improving market fundamentals, as positive absorption was recorded all across product subtypes in 2014. Demand at the national level was strongest for community / neighborhood space, and particularly robust within the Dallas-Ft. Worth, Houston, Atlanta, and Phoenix markets. The Cincinnati, Detroit, and Milwaukee markets led absorption for retail space in the Midwest region. Aided by a strong half of the year, absorption remained positive in the Twin Cities market in 2014, with the strongest demand in the market recorded at neighborhood centers and specialty centers. Although relatively modest compared to other sectors, the pace of new retail construction activity increased in 2014, with developers increasingly focused on delivering new neighborhood center product. The most active markets for retail construction included the Northern New Jersey, Los Angeles, San Antonio, and Dallas markets. Significant new retail construction activity in the Dallas-Fort Worth market is underway in the north Dallas and Plano submarkets. Construction activity is expected to remain brisk within these markets through the near-term, but the most significant uptick in new supply volume will come within the Las Vegas market. Over half of all new retail space added within the Midwest region within 2014 was delivered within the Chicago and Kansas City markets. Spurred by positive absorption, the average vacancy rate in the national retail market trended downward by 20 basis points in 2014. Vacancies remained below 6.0% in the regional mall and power center segments, with all segments now reporting average occupancy levels in excess of 90.0%. Among regions, retail occupancy levels are highest within the West and Northwest regions, with the San Diego and San Francisco markets noting the tightest market conditions. Occupancy levels in the San Diego market demonstrated healthy improvement during the year, as an increase in demand easily outweighed new deliveries. Fostered by positive absorption, the retail vacancy rate in the Twin Cities market decreased slightly in 2014, and remains favorable compared to other Midwestern markets. Asking rents in the national retail market advanced by 1.7% over the year ended in December of 2014, outpacing the 1.0% gain for the twelve months ending in December of 2013. The strongest asking rent growth during the year was posted within the San Francisco and South Florida markets, most notably within the Miami market. Rents in the Miami market have advanced significantly in recent years, with asking rents along Lincoln Mall swelling far past pre-recession levels. Retail asking rent growth throughout the Midwest remains modest compared to growth in the coastal and Texas markets, yet asking rents continue to inch upwards across most major markets within the region. Asking rent growth in the Twin Cities market has been bifurcated by asset class, with rents for Class ‘A’ product demonstrating healthy improvements and rent for Class ‘C’ product showing more modest progress. Comprising approximately 22.0% of all sales activity among the four major property types, sales volume in the national retail sector increased by nearly 20.0% year-on-year in 2014. Noteworthy sales transactions during the year within the national retail sector included a six-property portfolio along Lincoln Road Mall in Miami Beach and the Gucci Building in Beverly Hills. In one of the largest real estate transactions in the history of the South Florida region, Terranova Corporation and Arcadia Realty sold a six-property portfolio containing properties along the pedestrian-oriented Lincoln Road Mall in August of 2014 for $342 million or roughly $3,000 per square foot. The portfolio was sold to a joint venture consisting of Morgan Stanley Real Estate Investing and Terranova Corporation, which will remain a part owner in a newly formed entity. Built in the late 1930s, the Gucci Building sold in January of 2014 for a reported $108 million, which equates to sale price of nearly $8,000 per square foot. Located on the west side of Rodeo Drive, within the Golden Triangle of Beverly Hills, Gucci occupies the entire property on a triple-net lease, and according to reputable sources, the property traded at a cap rate of 3.75%. In one of the largest retail sale transactions in the Twin Cities market during the year, Woodbury Lakes sold for $64.5 million or approximately $176 per square foot in July of 2014. The seller in the transaction, RED Development, purchased the property out of foreclosure for $35 million in 2010. Although facing significant headwinds, momentum continues to build within the national office sector, as rising demand boosted year-on-year absorption figures by approximately 30.0% in 2014. Healthy demand in the national office sector lifted absorption figures up to levels not witnessed since 2006, with the strongest absorption recorded in the New York City, Houston, San Jose, San Francisco, and Chicago markets. The pace of office absorption within Central Business Districts outpaced absorption in Suburban counterparts, while a flight to quality supported the strongest demand within the Class ‘A’ segment. A number of major suburban markets did record sizeable increases in absorption figures, and demand for suburban office space in the Midwest region in 2014 was particularly healthy within the Kansas City market, with the Johnson County submarket absorbing nearly 850,000 square feet of office space during the year. Led by the Minneapolis CBD submarket, absorption figures in the Twin Cities office market demonstrated marked improvement compared to 2013, driving the market’s overall vacancy rate lower. Despite development activity remaining below historical norms, new national office construction deliveries increased by roughly 20.0% in 2014 compared to the year prior. An expanding office construction pipeline reflects rising confidence from developers and signals an accelerating pace of new construction activity through the near-term. The amount of office space under construction at the national level is up 75.0% compared to the year prior, with construction on nearly 105 million square feet of space underway. On the national level, new office construction activity is most robust within hubs in the West region, including the San Jose, San Francisco, and Seattle markets, and major metropolitan areas in the Northeast region, including the New York City and Philadelphia markets. Construction is underway on the Comcast Innovation and Technology Center in the City Center of Philadelphia, and upon completion, Comcast announced plans to occupy 1.33 million square feet of office space within the development. Supported by positive absorption, the vacancy rate within the national office market declined by 60 basis points during the year, though the average office vacancy rate remains in the mid-15.0% range. Most markets reported occupancy gains during the year; however, the Miami, Phoenix, and Las Vegas markets have observed the most impressive gains over the last two years. Office vacancy rates slipped to a six-year low in Manhattan in 2014, and occupancy levels remain relatively strong within technology hubs along the West Coast and a number of secondary markets, including Pittsburgh and Nashville. Among markets in the Midwest region, vacancy rates remain tightest with the Twin Cities, St. Louis and Columbus markets. Falling into the mid-16.0% range at the close of 2014, the average vacancy rate in the Twin Cities office market decreased by 100 basis points during the year. Rent growth accelerated into the early stages of 2014 and then demonstrated signs of leveling off through the year. Year-on-year, the nation’s average office asking rent increased by approximately 4.0% in 2014, with the strongest growth recorded in the Central Business District subsector. Asking rent increases of over 5.0% year-on-year were noted across several markets, including the New York City, San Francisco, San Jose, San Francisco, and Chicago markets. Although most major metropolitan areas noted gains during the year, office rent growth remained subpar within most markets the Midwest region in 2014. Recording rent growth in excess of 3.0% during the year, the Chicago and Twin Cities office markets were noticeable exceptions among Midwestern markets. Accounting for nearly 35.0% of all sales activity among the four major property types, sales volume in the national office market increased year-on-year by approximately 15.0% in 2014, surpassing $115 billion during the year. Fostered by strong investor interest, the largest pricing gains during the year were recorded in the San Francisco, Washington D.C., Houston, and Boston markets. Notable office sales transactions during the year included 100 California Street in San Francisco and PNC Place in Washington D.C. Situated within the Financial District in San Francisco, 100 California Street sold for $182.25 million, or approximately $630 per square foot, in September of 2014, trading at a cap rate of 2.5% on actual figures. The buyer, a subsidiary of Fidelity Investments, planned to renovate the common areas of the building and reposition the asset for tenants in the technology sector. Located within the Central Business District in Washington D.C., two blocks from the White House, PNC Place sold for $392 million in October of 2014, topping the $1,000 per square foot barrier. The buyer was a joint venture between Norges Bank Investment Management and TIAA-CREF. Both properties were approximately 85.0% leased at the time of sale. Setting a new high water mark in the Twin Cities market, the Normandale Lakes Office Park sold for $368.95 million or approximately $217 per square foot in October of 2014. Containing 1.7 million square feet of space within five buildings along the Interstate 494 corridor, the property previously sold for just over $265 million in 2012.